BUT FOR OHIO STATE, WE WOULD LACK THE CRITICAL TOOLS TO MAKE ACCURATE CLIMATE PREDICTIONS. For 30 years, research partners Lonnie Thompson (PhD, geology, 1976) and Ellen Mosley-Thompson (PhD, geography, 1979) have traveled the globe gathering clues to get a more definitive picture of our planet’s climate system. They’ve retrieved ice cores that contain a diary of past climate conditions, some dating back to the last ice age. Their analyses of these ice cores reveal detailed, comprehensive records of how climates change over time and distance, information vital to accurately forecast future climate change worldwide. 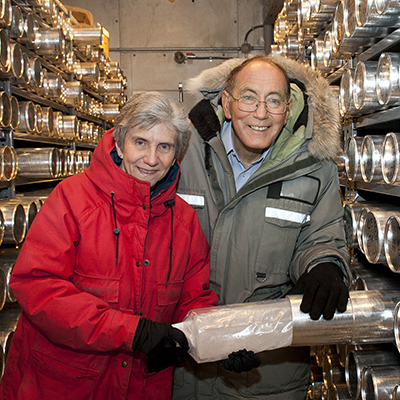 The Thompsons founded the world-class Ice Core Paleoclimate Research Group (ICPRG) at Ohio State and created an impressive “library” of the Earth’s climate history. Distinguished University Professor and director of the Byrd Polar Research Center (BPRC) Mosley-Thompson is a leading expert on the study of ancient climates. She has led nine expeditions to Antarctica and six to Greenland. Distinguished University Professor and BPRC senior research scientist Lonnie Thompson has led more than 50 expeditions; many consider him the world’s foremost authority on global climate change. His observations of glacier retreat over the last three decades confirm that glaciers around the world are melting, clear evidence that the warming of the last 50 years is now outside the range of climate variability for several millennia.